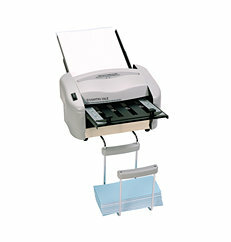 The Martin Yale Premier P7200 paper folder is a low-volume unit designed for home office and small business needs. The P7200 is very compact and takes up little space on your desktop. This machine is capable of folding up to four different types of common folds and automatically feeds and folds up to 4,000 sheets of paper per hour. The feed tray holds a ½ inch stack of paper, and the exit try holds 80 folded sheets, however, this is a low-volume unit that is designed to fold no more than several hundred documents a day. The Premier RapidFold P7200 and P7400 folders from Martin Yale are an ideal choice for entry-level paper folding in mailrooms, offices, churches or clubs. If you have any questions or are interested in purchasing the Martin Yale P7200 Paper Folder, visit us at SpiralBinding.com. We have great pricing on a full line of Friction Feed Paper Folders. Call us at 1-800-631-3572 for more information!